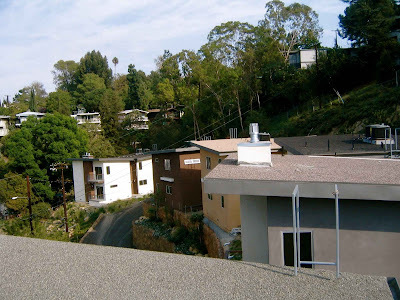 Awhile back when the big boring boxes were sitting idle, I went up on the roof for a look. Good views from there, I imagine that is where most of the tenants hang out out of necessity. Too bad they made slits for windows in those boxes or else you could see the great views from the inside. Hey developers, when building a house on the hill, at least put in some big windows to enjoy the view. Well, I guess you figured that out by now when they sat vacant for more than a year. Great job as always! Jack Wade "Searching For Soul"
I truely think these things come out of kits. Besides total cheapness what else can explain this lost opportunity to focus the architecture on the view. 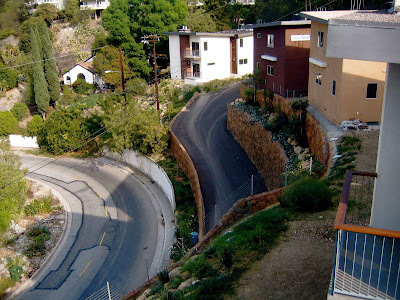 I don't know what the addresses are, so I can't check the potential ordinance issues, but it very well could have a lot to do with the draconian Northeast Los Angeles Hillside ordinance. The lots look awfully close to a ridgeline, which is why I say this. The NELA ord drastically limits the heights of buildings near ridgelines. Also, seismic considerations require shear walls which limit the amount of open space available for windows. Unless you want to spend a ton of money on steel construction. The days of craftsmen homes with a ribbon of windows are long gone for safety reasons.